So yesterday was pretty cool! 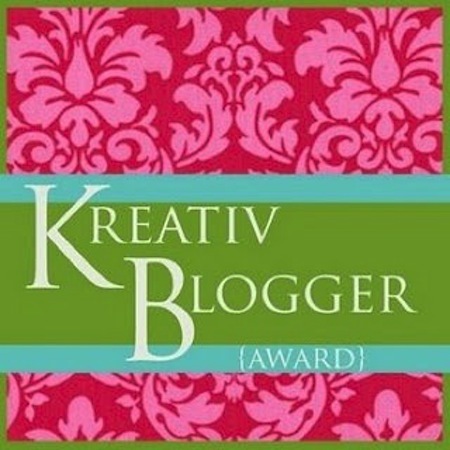 In the morning, I received a nomination for the Kreativ Blogger Award from The Thing About Joan. She has an amazing blog, and I recommend everyone check it out. I really enjoy reading her writing style and her topics. She’s amazing! First of all, thank you for the nomination! There are a few rules associated with this award, and I’m happy to oblige. The first is I’m to share 7 things about myself that readers might find interesting. 1. My favorite color changes almost regularly every couple of years. From 2010 to the start of 2012, it was yellow all the way. Now, I’m in love with tangerine and pinky-oranges. 2. I have three cats (I know, a knitter with cats! Who would’ve seen that one coming?). That’s not the interesting part. I think the interesting part, or so I’ve been told, is the names of the cats. They are AC (air conditioner), Zebra, and Starsky. 3. I honestly wanted to be Indiana Jones when I grew up. Or a Ghostbuster. 4. Fire ants, or ants in general, scare me to death. No other bugs scare me, though I don’t like flies or mosquitoes. 5. I was not allowed to read Harry Potter when the books first came out, so I didn’t read any of them until the fall of last year. I’m about halfway through the 5th one and have made no progress since October. 6. When knitting won’t cut it to calm my nerves, I bake up a storm. My husband’s favorite thing that I’ve made recently is a s’mores brownie with homemade marshmallow frosting on top. The more complicated a technique, even if I mess up and have to start all over again, the more relaxed I become. 7. I become distracted very quickly. Just now, trying to think of number 7, I went to Lifehacker.com and read a couple of articles, emailed a coworker, tidied up my desk, and then realized I was originally trying to think of a number 7 item for my list. Now comes the very hard part: Choosing 7 bloggers to pass the award to. I don’t mean hard because I don’t know of 7. Hard because I read or peruse over 100 blogs throughout my day, and choosing just 7 just doesn’t seem fair. But, alas, rules. 1. The Fat Squirrel Speaks: I’ve mentioned this a couple of times, but I love Amy Beth’s podcast. Her knitting is gorgeous and her energy is infectious. 2. Elegant Economy Designs: It’s always an absolute delight to read this blog. The pictures are vibrant and fun. 3. Knittybutton: Ali Tong makes the cutest knit items ever. I always smile when I get a new post from her on my WordPress Dashboard. 4. The Ramblings of a Knitting Goddess: The things she makes! Oh my. 5. Ohmygoodknits: There are a few DIY projects I want to try from this blog, but I keep coming back because of those beautiful blankets she makes. 6. Tiny Dino Studios: If I could, I’d buy up all their inventory. The yarn is so lovely, and I love reading Marla Holt’s posts. 7. Knitting on Trains: The topics and writing style keep me coming back as much as the pretty photos. I look up to all these bloggers and so many more for what they are able to create. They’re my crafting inspiration. I recommend you check them out. I’m sure you’ll end up loving their blogs as much as I do! PS: Totally sorry about the late post in the day. I try to do it when I get up in the morning, but I’ve been running full-speed since yesterday. I started this yesterday afternoon and finished it more than 24 hours later. Eep! Thanks so much for your kind words about my blog! I’m blushing! Yours is a must-read for me! Any chance I can get the recipe for s’more brownies — particularly the homemade marshmallow frosting? Please? 🙂 It sounds fabulous. Love the blogs you’ve chosen — is it wrong that I knit vicariously through your blog and other knitting blogs when I don’t have time to actually knit?